The RCMA420 monitors for ground-fault current in solidly-grounded and high-resistance-grounded AC/DC (single-phase or three-phase) systems. The RCMA420 is also compatible with systems that contain power conversion equipment, such as variable frequency drives and inverters. The pickup value is adjustable from 10 mA to 500 mA (for a higher pickup value, refer to RCMA423 series). A separately configurable pre-warning alarm is also available. Three separately adjustable time delays are included - a pickup delay, startup delay, and delay on reset. The RCMA420 provides an accurate, RMS value. Measurements are displayed in real-time via the device's on-board digital display. All device are configured using the display and push buttons. Two Form-C (SPDT) relay outputs are separately configurable to trigger on pre-warning or main alarms. 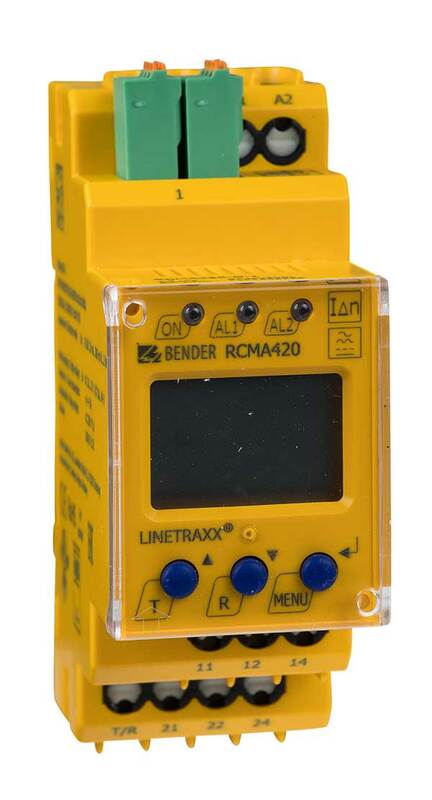 A single current transformer connects to the RCMA420 for measuring ground-fault current. A wide range of sizes are available. For systems requiring larger sizes, refer to RCMA423 ground-fault monitor.